Do you like to eat? to cook? food in general? Watch Food Network is the app for those who love cooking shows, food and recipes. Watch it wherever and whenever you want. 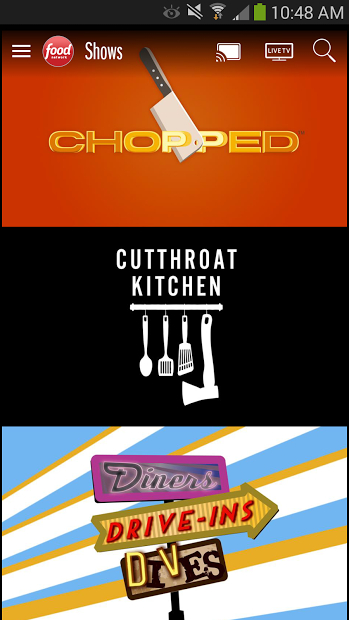 Full episodes, live TV and video extras from your favorite shows, like Chopped, Cutthroat Kitchen, Iron Chef America, The Pioneer Woman, Diners, Drive-Ins and Dives and more. New full TV episodes and original FoodNetwork.com videos are added daily! You don’t need to log in to have access to some content. Note: This app does not contain recipes. For recipes and more check out Food Network In the Kitchen. Watch Food Network can only be used in the United States, remmember to use our ‘trick’ if you are interested to use this app outside US.